Yesterday, Social Money debuted iWish, a product powered by GoalSaver, in India. 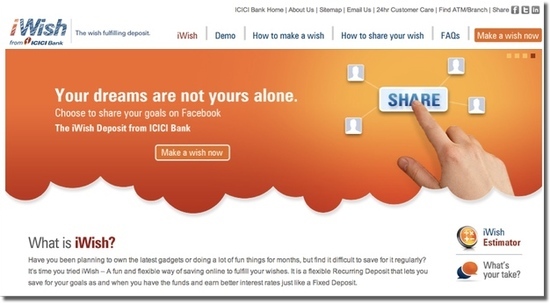 ICICI Bank, India’s largest private sector bank, now allows customers to publicly save for a goal using iWish, a product that has similar features as SmartyPig, one of Social Money’s consumer products. One difference between iWish and SmartyPig, however, is that iWish offers an interest rate of 7.5% while SmartyPig offers 1%. While ICICI is the first to offer a GoalSaver-powered product to its customers, there are many more FIs interested in the product, according to Scott McCormack, Social Money CEO. To learn more about Social Money’s GoalSaver product, watch its FinovateSpring 2012 demo.